Honeybees play an essential role in the production of our food through pollination; however, they are disappearing at an alarming rate, and the exact reason is yet to be determined. This enigma has come to the attention of many, and scientists are actively investigating potential causes of this decline. Loss of habitat, stress, and various diseases all play a role, but researchers are now looking at common pesticides as potential causal factors. Two commonly used pesticides, neonicotinoids and coumaphos, are being studied to determine their affect on honeybees and their central nervous system. Neonicotinoid is a common pesticide used on oil rapeseed, whereas coumaphos are used to kill the Varroa mite, which is parasitic to the honeybee. Researchers have found that individually, these pesticides impact the ability of honeybees to process information, specifically in memory formation and olfactory learning; however, the simultaneous application of both of the pesticides produces a much more severe effect. 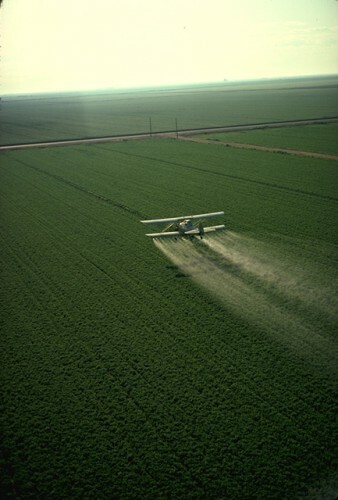 Pesticides being sprayed on a variety of crops. Courtesy of Wikimedia.org. Recent findings published in Nature Communications also show that neonicotinoids cause a type of neural inactivation in honeybees. Dr. Christopher Connolly of the University of Dundee in Scotland noted that when the pesticides were put directly on the brain, a loss of brain activity resulted. The patterns suggest that neonicotinoids cause epileptic activity in the brain, followed by a loss of activity. The pesticides ultimately affect the cognitive function and skills of honeybees, making it difficult for them to locate essential resources. Pesticides thus pose a problem, because memory formation and olfactory learning are key to the honeybee’s survival. 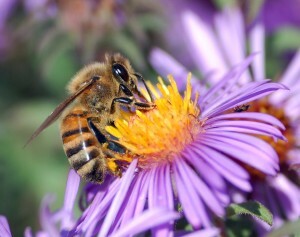 If these skills are compromised, the bees are unable to recall floral smells while searching for food. Dr. Sally Williamson, a researcher at Newcastle University, is concerned that such results show that these pesticides compromise the ability of bees to forage effectively and communicate with each other to locate sources of pollen and nectar. However, another study conducted by the UK’s Food and Environment Research Agency (Fera) no relationship between neonicotinoid exposure and honeybee cognition and suggest that the hypothesized effects may be misleading. A honeybee pollinating a flower. Courtesy of Wikimedia.org. Despite Fera’s assertion, the European Commission issued a two-year moratorium on the use of neonicotinoids on flowering crops. Yet, fourteen of the twenty-seven EU nations have objected to the ban, delaying the proposed suspension. The postponement seems to be good news for some, like arable farmer Mark Leggett. Leggett asserts that caution is needed before banning a product that helps farmers control pests and allows crops to be resilient. Whatever the final objective behind the ban may be, recent research into the effects of pesticides on honeybee cognition shows promising progress for determining major causes of the decline of honeybee populations. Cover Image: A population of bees on a honeycomb. Courtesy of fotopedia.com.